Metal Forming Industries offers cost-effective process design, prototyping, and contract precision manufacturing of customer specified components and assemblies from our Russellville, Indiana plant. Our Business Vision is to provide world class, competitive, contract manufacturing, based in the United States, to our global customers. Our unique combination of internal specialty cold forming, precision CNC machining, controlled atmosphere brazing, and other services allow us to offer our global partners numerous production process options to lower their current component costs. Our experience spans many industries and market segments, including: power semiconductor electronics, diesel engine components, resistance welding, automotive OEM and aftermarket, industrial battery, and electric power switching and protection. MFI’s ISO 9001:2015 certified production facility ensures that high quality components are manufactured to your specifications every time. Our manufacturing procedures are strictly controlled by our quality system with regular internal audits. Lean manufacturing principles are applied to optimize efficiency, driving down your cost while maintaining the highest quality standards. MFI’s ISO 14001:2004 protects our environment by establishing procedures for managing all chemicals and other byproducts of our production. We are one of the less than 6,000 firms nationwide that meet these requirements. Environment protection is one of the core values that drive every one of our strategies. Metal Forming Industries creates a business atmosphere with services that promote partnership with our customers. Vendor Managed Inventories coupled with small minimum orders allow MFI to react to demand fluctuations. Our flexible, well-trained workforce will adapt very quickly to achieve the solutions that are needed to keep you moving. Stocking programs with our key suppliers complete the coverage by providing access to additional raw materials with very short notice. Our proven new business development model ensures that samples and first run production parts arrive built to your specifications and according to the established schedule. Since 1991, MFI has been providing components to customers around the world. These experiences have given us the tools to manage issues across borders and oceans. 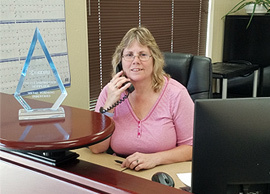 Our customer service team is ready to assist with international logistics, import/export documentation, and more. 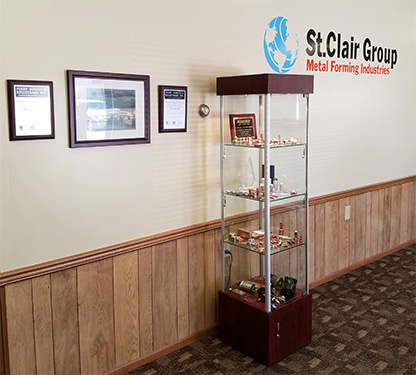 When the St. Clair Group purchased MFI in 2012 the company also gained 20 years of international business knowledge in areas including mergers & acquisitions, labor relations, foreign government regulations, and even lending. One more advantage of working with Metal Forming Industries is that it contributes to the development of American Manufacturing. When you are working with MFI you are working with a Conexus Indiana A+ Partner. We are committed to developing educational opportunities for those interested in a career in the modern manufacturing environment. The Conexus program works with Dream It. Do It. Schools across Indiana including North Putnam High School.